Keep baby's "first additions" as pristine as the rarest First Editions in this library-style storage system. The years go by so fast, and humble yet precious objects scatter as your children grow. Some day—maybe not the first time they ask for the car keys, but certainly when they have their first child—they’ll remember them, and you will, too. Store cherished keepsakes like hospital name bracelets, lost teeth, and favorite binkies safely and all in one place with this library-style organizer using its illustrated labels, acid-free drawers, vertical files, and tiny envelopes. A cloth-covered casing resembling a museum-quality book makes this design an attractive addition to wherever you display your favorite collectibles. Made in China. Remove surface stains, dust, and dirt by brushing cover with soft brush and/or cloth. Dry cleaning sponges made of vulcanized rubber and absorbent putty may also be used. Interior: Use a document cleaning pad to gently wipe away dirt and dust. Nice idea! it's not very practical due to the heavyweight and sorta silly drawers. I have bought this twice now for expecting parents- perfect! This has been an excellent product that continues to be a great gift for new parents - well received!! Would order again - very happy with it! Fantastic purchase for expecting parents! My wife and I are less than one month away from having our first child, I saw this and had to buy it to keep all the memories of our little boy safe! Gr at way to keep track of milestone mementos! This Library is absolutely genius! This Keepsake Library is SO perfect for the person that doesn't necessarily want to go through the process of making a Baby Book but still wants to save/chronicle special moments from their lives. It has cozy little drawers to save things like baby teeth, locks of hair, hospital bracelets, & slightly larger drawers for items like baby shoes or a small stuffed animal. It also comes with handy stickers/labels/envelopes/and a few fun surveys to help document the experience. The packaging is beautiful, the drawers all pull out smoothly and it comes in neutral colors that would look nice in any home. Interesting, different and useful gift for new parents! Was not able to attend event but heard the mom to be really liked the gift. I know she will use it too. A great gift for moms! Easy way to have keepsakes in one place. 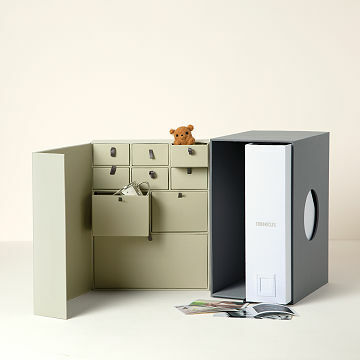 I bought this to keep all my baby's keepsakes organized in one place.